Recently, the Taiwanese technology company launched the HTC U11 smartphone. It has now been revealed that the new smartphone has added features that will allow users launch applications and do other things on the phone just by squeezing the phone pressure-sensitive frame. The first design of the smartphone only supports limited applications that can use this feature called ‘Edge sense‘ technology. As seen from a few youtube video, the tech company is now working tirelessly to make the Edge sense technology compatible with more apps on the phone. From the Youtube video, the smartphone can zoom in Google Maps and Google photos by squeezing the size bezels of the HTC U11, the device ability to change Google Calendar views, answer and hang up calls, dismiss alarms and even pause or play YouTube videos using the squeeze feature. However, HTC has not yet announced when it plans to launch this new feature to the new U11 smartphone officially. But for now, the new feature is definitely part of the company next plans. HTC U 11 comes with eight sensors on the side bezels to register the squeezes. These sensors are embedded with the ‘Edge Sense’, and the feature can be customised inside the settings. The chipset is made of Qualcomm Snapdragon 835 MSM8998, graphics Adreno 540 with an Octa-core (2.45 GHz, Quad core, Kryo 280 + 1.9 GigaHertz, Quad core, Kryo 280) processor and supported by a ram of 6 gigabytes. HTC U 11 has a screen size of 5.5 inches (13.97 cm), a display resolution of 1440 x 2560 pixels with touch screen enabled. The smartphone comes with an internal memory of 128GB, and the memory can be expandable to 2TB (now that’s amazing). The front camera is of 16 MP resolution and 12MP autofocus rear camera, BSI sensor and selfie voice command. The device has a standby time battery of up to 336 Hours(4G) / Up to 336 Hours(3G), talk time Up to 24.5 Hours(4G) / Up to 24.5 Hours(3G) with a capacity of 3000 mAh which charges quickly. Wi-Fi 802.11/ 5GHz connection, Mobile Hotspot, Bluetooth v4.2, Near field communication(NFC), network support of 2G, 3G, 4G, with an A-GPS inclusive. HTC U11 has a thickness of 7.9 mm, the width of 75.9 mm; it weighs 169 grammes with Water-resistant and dustproof features. Other unique features include a front fingerprint sensor, Light sensor, Proximity sensor, Accelerometer, Compass, Gyroscope. An operating system of Android v7.1 (Nougat), a dual Sim slots, a loudspeaker. The device comes in variant colours like Silver, Sapphire Blue, Brilliant Black, Ice White and Solar Red. What is HTC U11 Price and Availability Status? 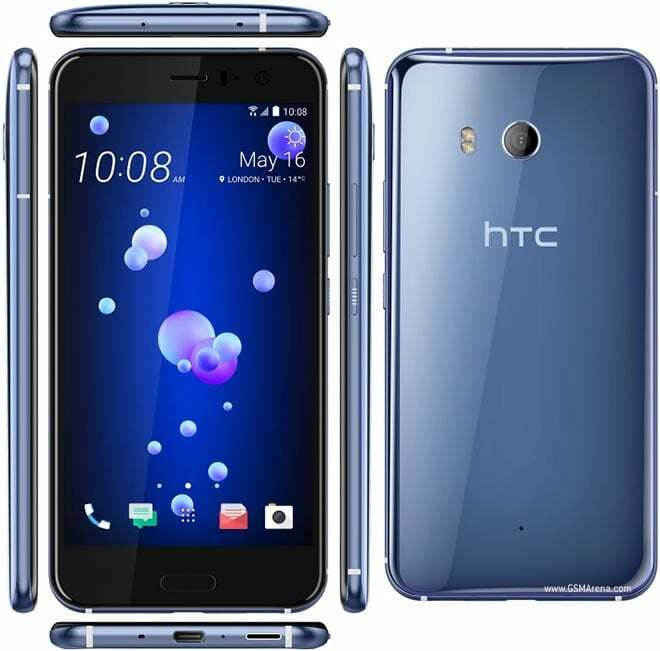 You can click on the links below to view latest HTC U11 price & availability. Jumia Nigeria |from N13,995 [eafl id=”14751″ name=”Jumia NG HTC” text=”View Price Offers, Click Here”]! Jumia Kenya |from Ksh3,530 [eafl id=”15567″ name=”Jumia KE HTC” text=”View Price Offers, Click Here”]! Jumia Ghana |from GH?159 [eafl id=”15655″ name=”Jumia GH HTC” text=”View Price Offers, Click Here”]! The HTC U11 is priced in India at Rs. 51,990, 83,000KSH and N250,000 Nigeria. Notably, the smartphone was first launched in Europe at a starting price of EUR 749 (around Rs. 53,000) and $749 (roughly N240,000) in the US. The phone is made available in Amazing Silver, Sapphire Blue, Brilliant Black, Ice White and Solar Red.